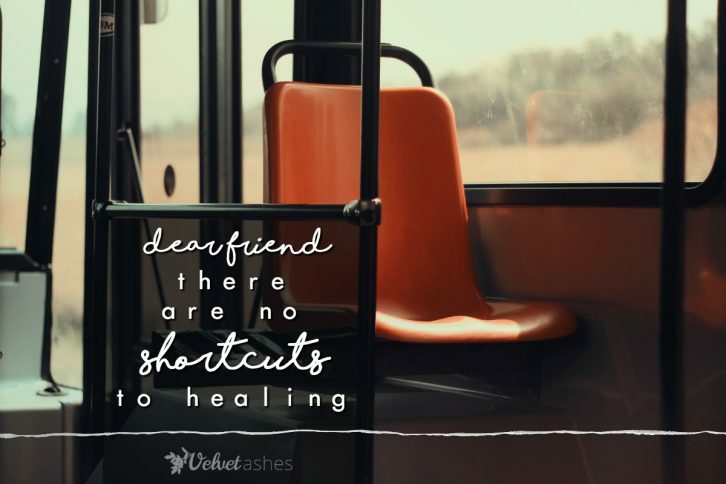 There are no shortcuts to healing. There are no shortcuts to wholeness. For we can’t know God as Healer without first being wounded. And we can’t know God as guide without first being lost. We can’t know Him as counselor without first being confused. And we can’t know Him as comforter without first sustaining pain. We can’t know Him as intimate companion without first feeling abandoned. And we can’t find our identity in Christ alone without first losing it elsewhere. There is no way around the ache of the human soul. There is no detour through the pain. None of us gets to skirt around the edges. Fully immersed in its grief. Even if that way be long and broken. But don’t you give up Hope. Hold on to the name of our Jesus. This waiting, it takes time. And the hard, Spirit-assisted work of letting go of our entangling sins. But in Jesus there is healing. But in Jesus there is wholeness. Originally published here, reprinted with permission.